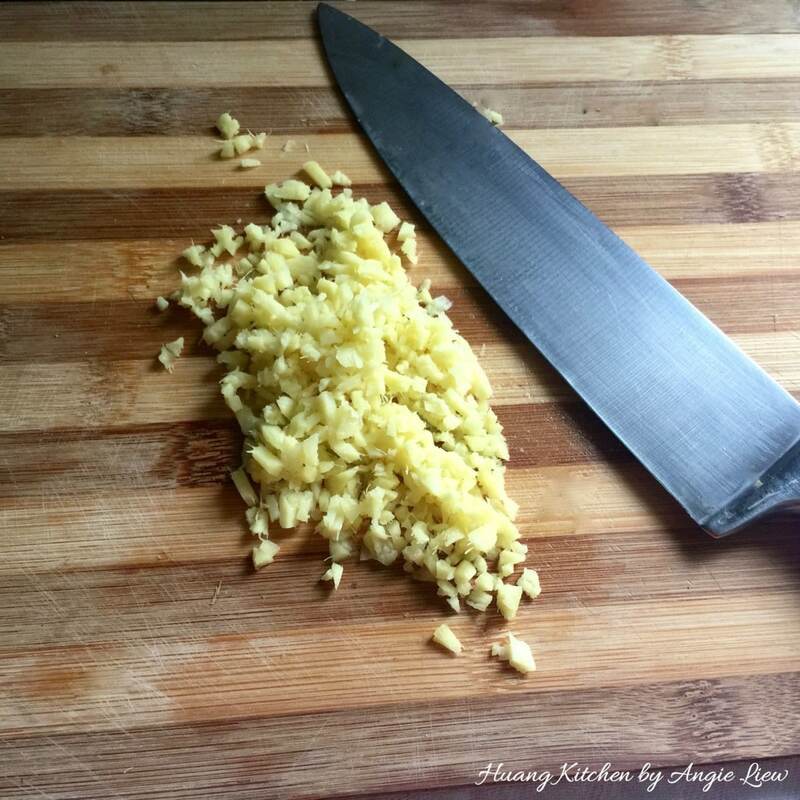 Learn To Cook In Minutes! There are so many things to love about this beautiful vegetable dish. It’s quick to cook, tasty and full of goodness. 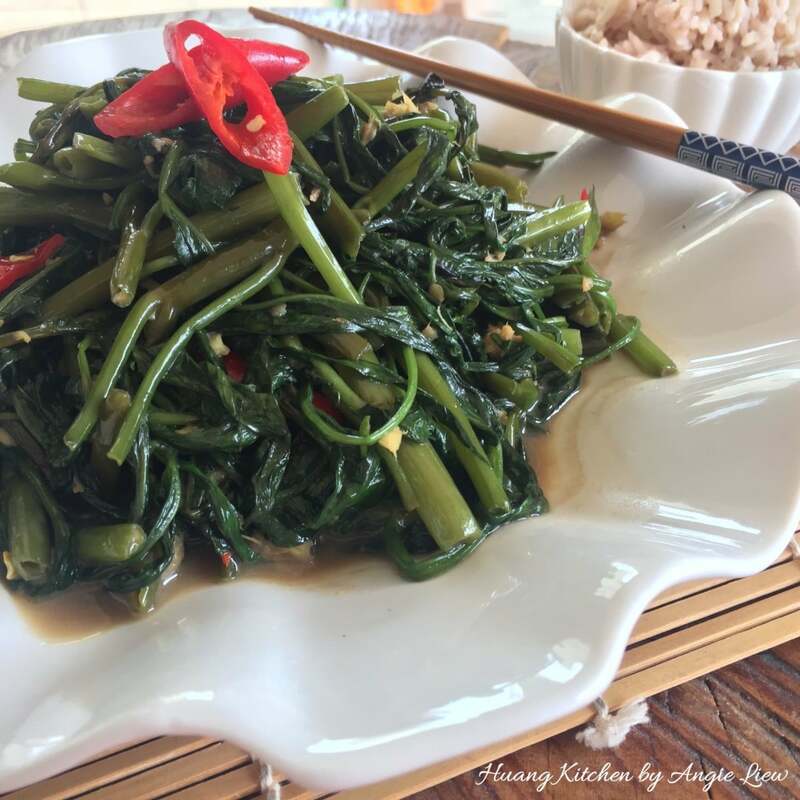 This simple, yet delicious stir fry water spinach also makes a great vegetarian stir fried dish. It is sure to satisfy vegetarians and meat-lovers alike. A favourite greens, these green leaf and hollow-stemmed vegetables are often served in restaurants and at home too. 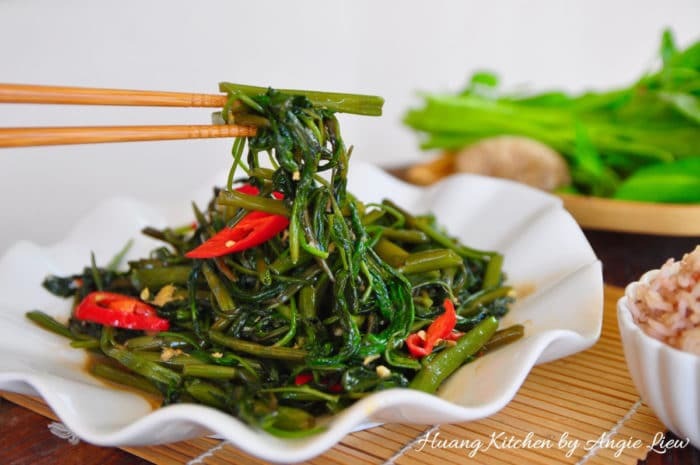 Chinese Water Spinach, or known as Kangkung (空心菜 / 蕹菜) are just great for stir frying. The addition of fermented beancurd gives the dish such a great savory flavour. Although stir frying may seem like a no-brainer, dishing out a plate of crunchy and fresh looking greens may require a little skill. The secret is to keep the cooking time really short. 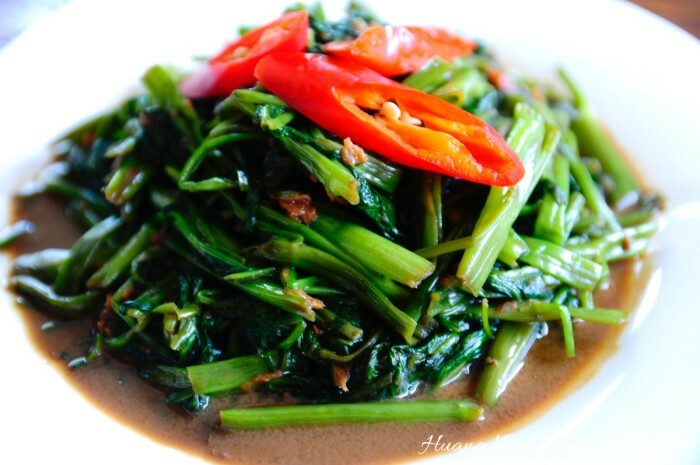 A zichar favourite, Stir Fried Fermented Beancurd Water Spinach (Kangkung). The addition of fermented beancurd gives the dish a great savory flavour too! 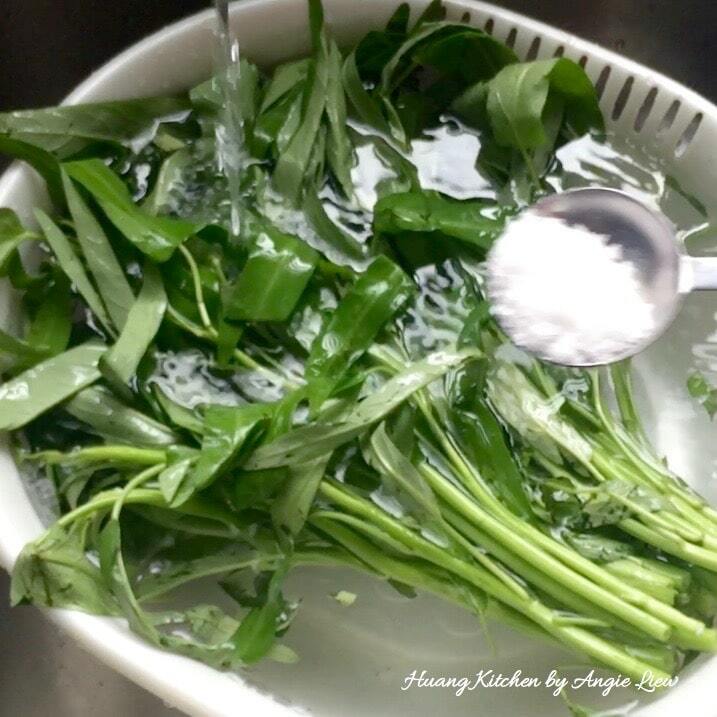 Wash and soak chinese water spinach in salt water. Then drain well. 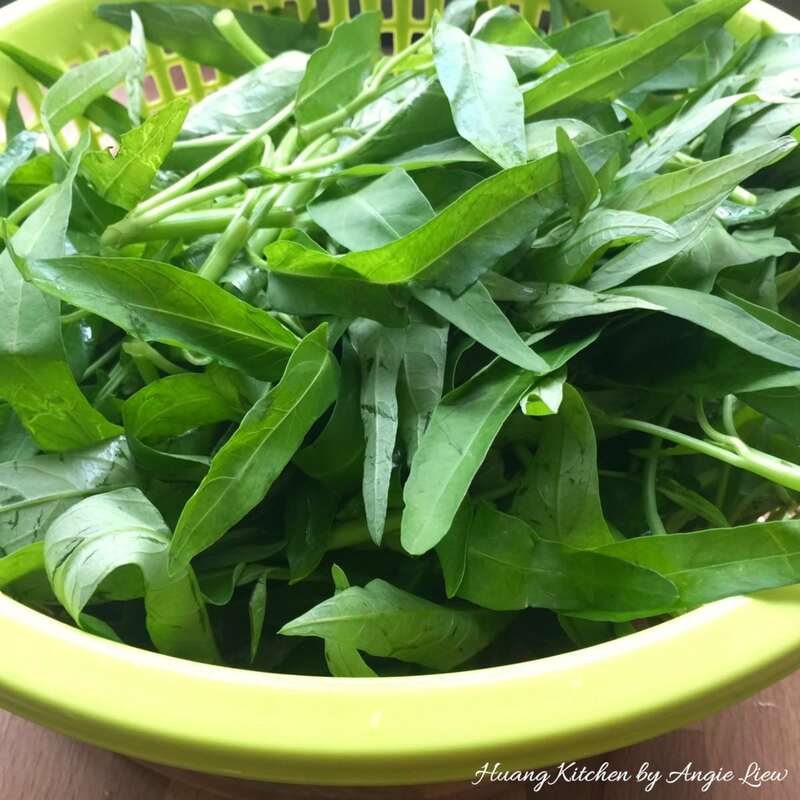 Pluck or cut the water spinach into smaller sections and set aside. Then, wash and skin a piece of ginger. Mince into small pieces. 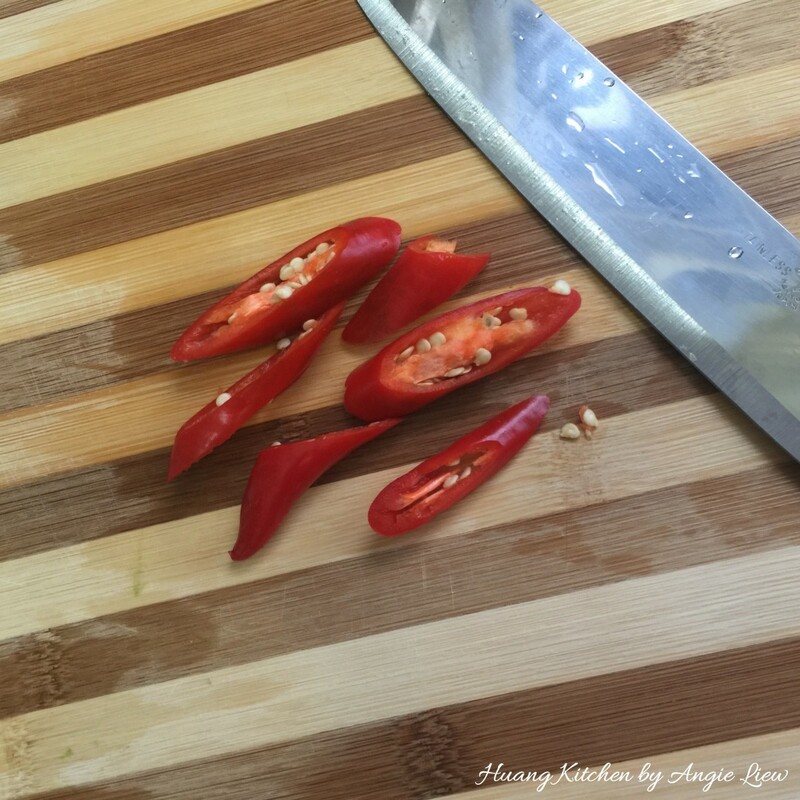 Next, cut a red chili into thick slices and set aside while we prepare the seasonings. 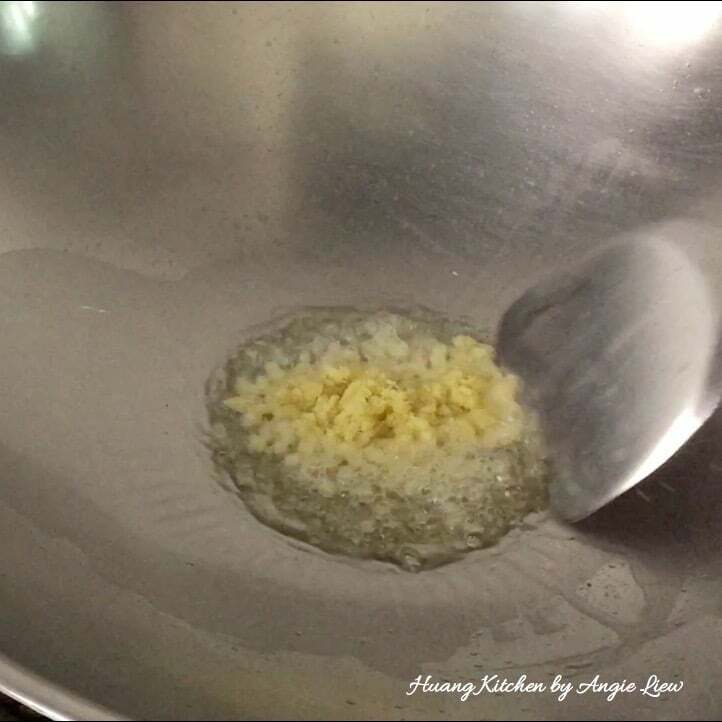 Place fermented beancurd, sugar, ground white pepper, sesame oil and vegetarian oyster sauce in a small bowl. 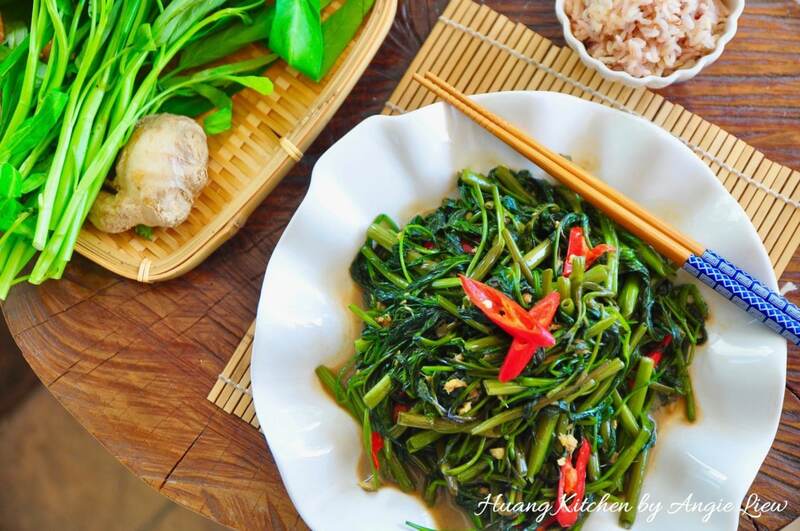 Stir to mix everything together and we're ready to fry the chinese water spinach! To stir fry, first heat oil in wok over high heat. 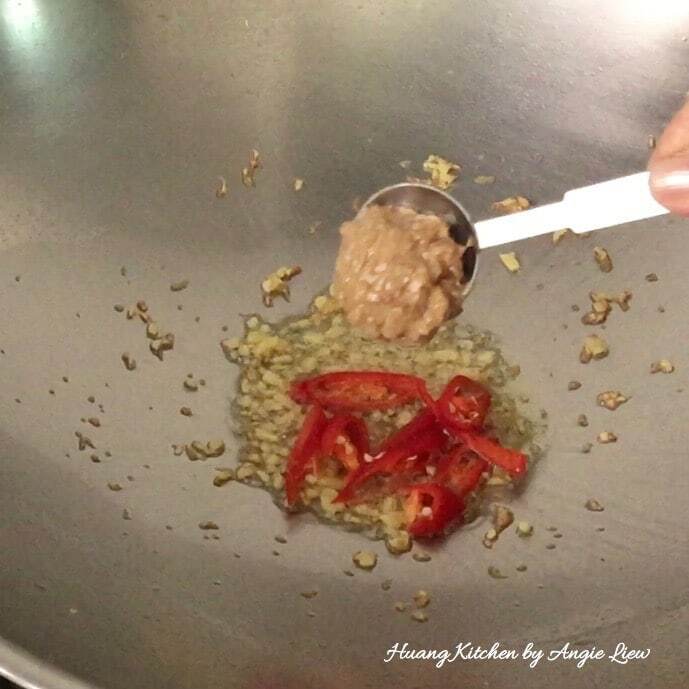 Then add in minced ginger and stir fry for 10 seconds. Then add in the cut red chilies and mixed sauce. Stir fry until fragrant over high heat, about 1 minute. Add in the drained chinese water spinach. Using a folding motion, stir fry the greens briefly for 30 seconds. Stir fry until the leaves have just withered and vegetable is moist. Then add in a splash of hot water and continue to stir fry for another 30 seconds, making sure the greens is well mix with the seasonings. Turn off heat and give it a final toss. And we're done! Transfer to plate and serve immediately with steamed rice. As always, ENJOY! 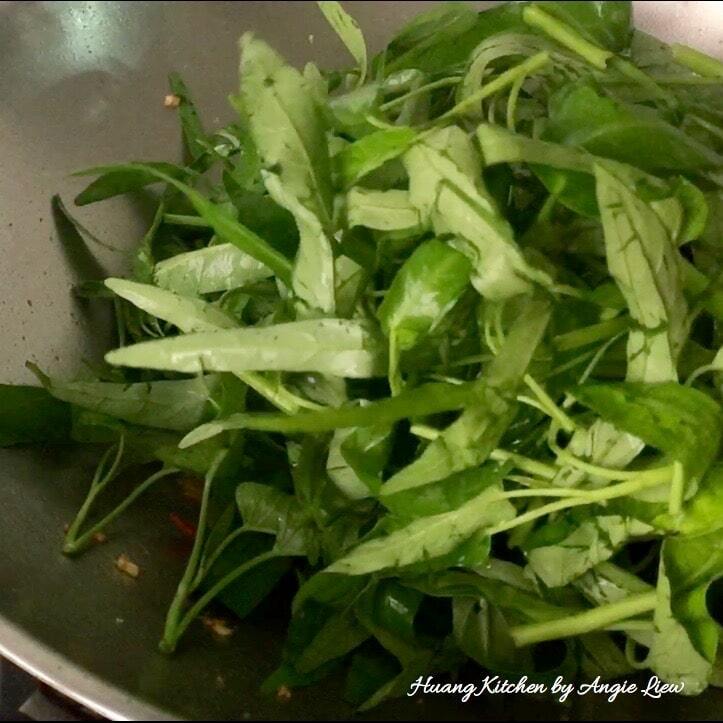 Be sure to keep the cooking time really short so the chinese water spinach will stay crunchy and fresh green in colour. 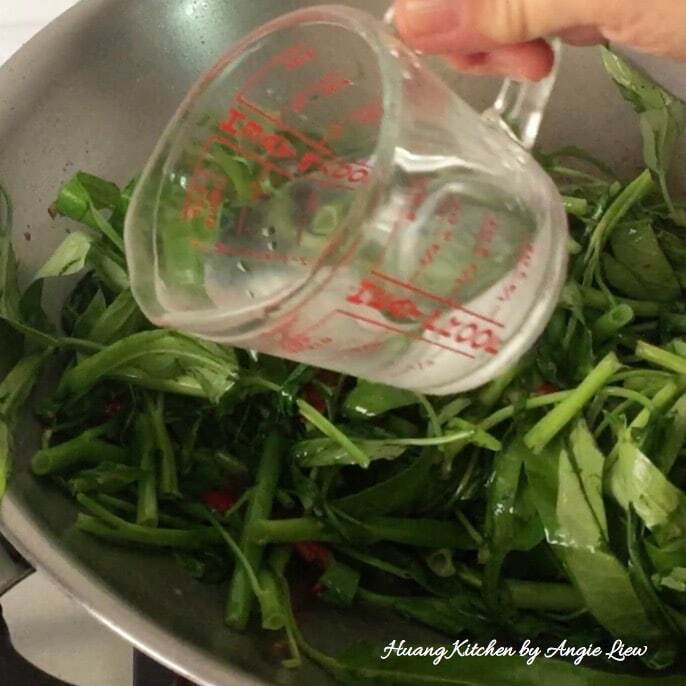 Its best to use a wok to stir fry the greens, as the wok is deep enough to hold the vegetables when cooking. And avoid over crowding the wok. The secret to good stir frying is not to put too much in the wok at one time. Otherwise, the vegetables will sweat instead of frying. It's important to make sure the vegetables are very dry. 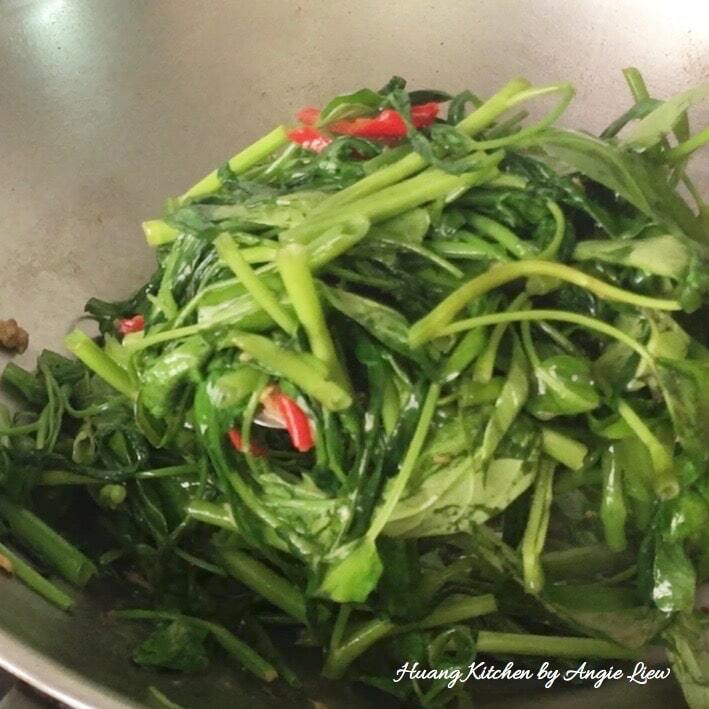 Otherwise, the green leafy vegetables will steam and braise in the wok and lose their crisp texture. This recipe can be substituted with other leafy vegetables. 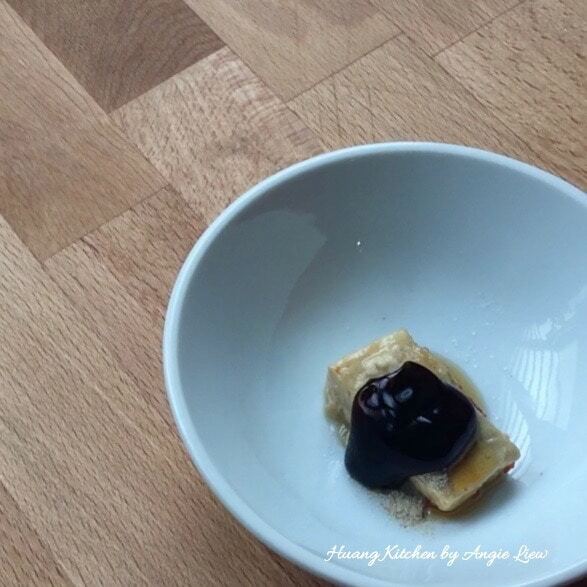 Angie Liew (known as Huang) has a strong love for cooking from a young age. Being a self taught chef, she focuses on improving cooking recipes, simplifying and documenting cooking methods so that her great home cooked dishes can be served and shared among family and friends. Want to get more step by step recipes like this in your inbox? Subscribe to our free recipe newsletter!